Cambridge, Mass. – August 4, 2016 – A new company will commercialize sensing technology invented at Harvard University that can perform instant, in-field characterization of the chemical make-up and material properties of unknown liquids. Validere, cofounded by Harvard scientists and engineers, has raised an initial round of seed capital and has entered into a worldwide exclusive licensing agreement with the university to pursue applications in quality assurance and liquid identification. Validere aims to develop the licensed technology, called Watermark Ink (W-INK), into a pocket-sized device that could be used by first responders to quickly identify chemical spills, or by officials to verify the fuel grade of gasoline right at the pump. Unlike other techniques for identifying and authenticating liquids, Harvard’s solution is inexpensive, instantaneous, and portable. Developed in the laboratory of Joanna Aizenberg, the Amy Smith Berylson Professor of Materials Science at the Harvard John A. Paulson School of Engineering and Applied Sciences (SEAS) and a Core Faculty member of Harvard’s Wyss Institute for Biologically Inspired Engineering, the W-INK concept exploits the chemical and optical properties of precisely nanostructured materials to distinguish liquids by their surface tension. Marko Lončar, Tiantsai Lin Professor of Electrical Engineering at SEAS, also contributed to its development. Akin to the litmus paper used in chemistry labs to detect the pH of a liquid, the detector changes color when it comes in contact with a liquid with a particular surface tension. The color-changing strip can be programmed to respond precisely to the unique surface tension exhibited by any liquid of interest. The W-INK technology, which received early support from the Air Force Office of Scientific Research and a proof-of-concept contract from the U.S. Department of Transportation, could have important applications in industry and government. “Validere translates this technology to create inexpensive, one-time-use test kits that can be used anywhere in the field to visually identify unknown liquids, all without the need for a dedicated power source,” said Ian Burgess, co-founder, CEO and CTO at Validere, who co-invented W-INK as a doctoral student at SEAS and technology development fellow at the Wyss Institute. Harvard’s Physical Sciences and Engineering Accelerator provided seed funding that enabled Aizenberg’s group to advance the technology from the lab to the pilot scale and attract further investment. The research group continues to refine W-INK to expand its range of applications. Following a set of original publications describing W-INK technology in the Journal of the American Chemical Society, ACS Nano and Lab on a Chip, in January 2016, Aizenberg, Lončar and Burgess reported improvements that make possible a colorimetric test for determining the volatility of liquids. This capability, described in a paper published in Scientific Reports, is of particular interest to the Department of Transportation. The ability to rapidly profile the volatility of crude oil, which is commonly transported by railroad, means decisions about proper transport containers can be made at the point of extraction in the field, helping to prevent accidental explosions. DOT is also supporting development of test kits for analyzing hazardous spills. 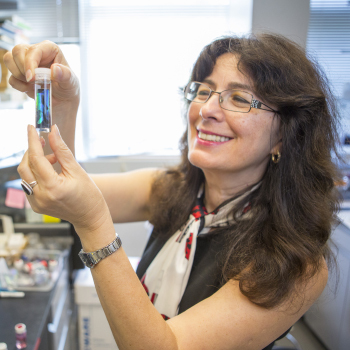 Aizenberg’s lab specializes in reverse-engineering nature. W-INK mimics two biological systems to achieve a tunable device with properties that allow it to change colors when it comes in contact with certain liquids. The wings of some species of butterfly owe their brilliant colors to structure rather than pigment; the surface of each wing contains networks of tiny pores, the size of which determines the perceived color. Meanwhile, brittle stars, relatives of starfish, can change color from black to white by modulating the position of pigmented cells inside lens-like, light-focusing structures arranged in an array across the star’s back. By combining both of these mechanisms so that they respond optically to liquid infiltration into chemically modified porous structures, Aizenberg’s team developed a liquid decoder that is small enough to fit in the palm of the hand and can function without a power source. Engineered surface properties interact with liquids to change the interfacial chemistry of the test strip, which instantly causes corresponding color changes or markers to appear. With support from the U.S. Federal Railroad Administration, Aizenberg is now leading research efforts to optimize the sensing capabilities, while Burgess is spearheading Validere’s development of software and an interface device that will translate visual test results into recommended action for handling identified liquids. The device will pair with disposable strips to comprise customizable field test kits that can be tailored to identify virtually any liquid or liquid mixture. “The goal is to remove the element of human error from the identification and categorization of unknown liquids,” Burgess said. In 2013, W-INK was selected to receive the R&D 100 Award—known as “the Oscar of Innovation”—from R&D Magazine. The research underlying Harvard’s W-INK technology was supported by the Wyss Institute and grants from the Air Force Office of Scientific Research; the Natural Sciences and Engineering Research Council of Canada; and the U.S. Department of Homeland Security (DHS), administered by the Oak Ridge Institute for Science and Education, through an interagency agreement between the U.S. Department of Energy and DHS. 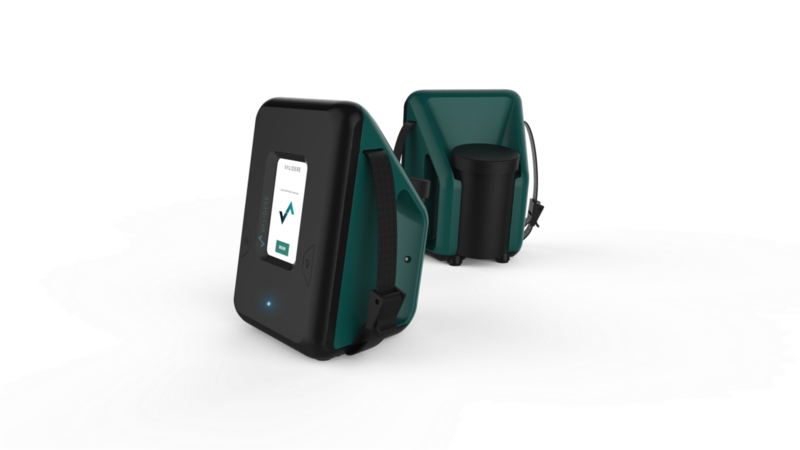 The Validere analyzer incorporates the licensed technology, called Watermark Ink (W-INK), into a pocket-sized device that could be used by first responders to quickly identify chemical spills, or by officials to verify the fuel grade of gasoline right at the pump. Developed in the laboratory of Joanna Aizenberg, the Amy Smith Berylson Professor of Materials Science at the Harvard John A. Paulson School of Engineering and Applied Sciences (SEAS), the W-INK concept exploits the chemical and optical properties of precisely nanostructured materials to distinguish liquids by their surface tension.